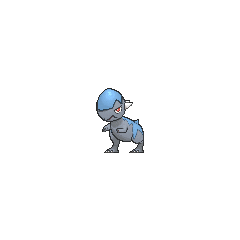 Cranidos in game: 1,824 Who? Important notice! Pokemon Cranidos is a fictional character of humans. Cranidos (Japanese: ????? Zugaidos) is a Rock-type Fossil Pokémon introduced in Generation IV. 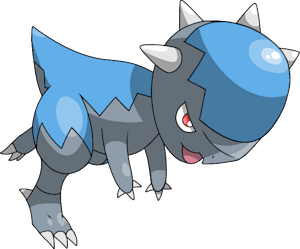 Cranidos is a gray, dinosaur-like Pokémon resembling the Pachycephalosaurus. It has a hooked beak, red irises, and a hard, blue, dome-shaped head with four spikes on its back. It has stubby arms with three claws; despite the stubbiness, it can attack with them. The back half of its body has a large, spiky pattern of blue and it has a short tail. It has feet with three forward claws and one backward. Its main attacking prowess involves charging head-first into its opponents. When it lived in dense forests and jungles 100 million years ago, it would use headbutts to snap obstructing trees and down its prey. A Cranidos appears in both Shapes of Things to Come and A Gruff Act to Follow! under the ownership of Roark. In Wild in the Streets!, Roark's Cranidos evolved into Rampardos. A Cranidos appeared under the control of the Pokémon Pinchers in Pokémon Ranger: Guardian Signs (Part Two) where it fights against Ben. He later captures it and releases it back into the wild. 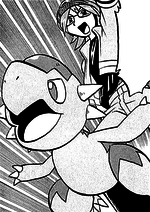 Cranidos appeared in the fifth and sixth rounds of the Diamond & Pearl chapter Pokémon Adventures. A Cranidos is owned by Roark, which he sends out against Platinum in her Gym match. It seems to be one of the first Pokémon that he owned, having been hatched from an Egg long ago. 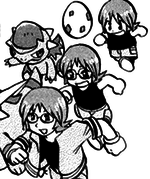 It later evolved to Rampardos around the three Sinnoh Trainers' arrival on Canalave City. Roark's Cranidos also appeared in Pokémon Diamond and Pearl Adventure!, where it assisted its Trainer in rescuing Hareta, who had been captured by Team Galactic's Grunts. 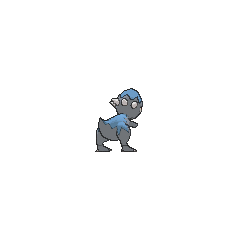 Later, Cranidos was used in a one-on-one Gym battle with Hareta's Piplup that ended in Hareta's favor with the help of an Oran Berry Roark gave to him earlier. Cranidos has the highest base Attack of all unevolved Pokémon, and the lowest base Defense of all Rock-type Pokémon. 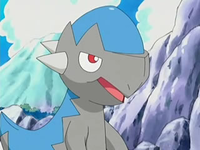 Cranidos is based on a Pachycephalosaurus. 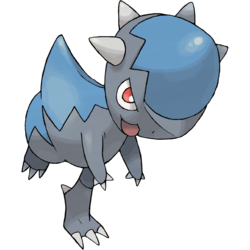 Cranidos is derived from cranium. Zugaidos is derived from ??? zugaikotsu (cranium).